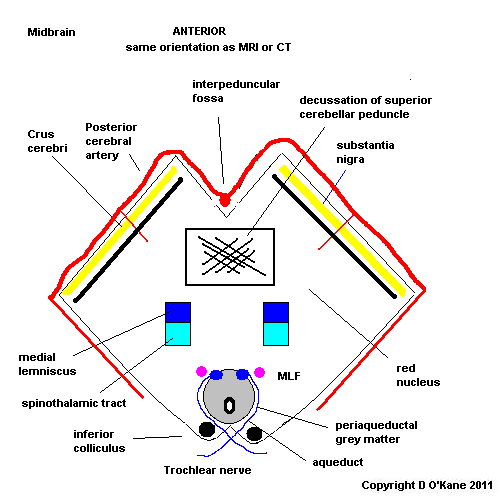 Midbrain lies below the diencephalon. Ventrally (in front) are two large cerebral peduncles containing the fibres of the internal capsule on either side of the midline in which lie axons on their way from the cerebral cortex to the brainstem or spinal cord including the pyramidal tracts. The emerging oculomotor nerves emerge from between these. On the dorsum lies 4 small hillocks of the two super colliculus (reflex eye movements) above and the two inferior colliculi (auditory pathway) below. The trochlear nerve emerges just below the inferior colliculus and is the only cranial nerve to emerge posteriorly. It contains the Cranial nerve nuclei 3 and 4. Smallest part of the brainstem and is continuous with the diencephalon above and the pons below. Substantia nigra lies between main brainstem and cerebral peduncles. Pigmented. Important in Parkinson's disease. In the midline posteriorly lies the aqueduct carrying CSF from IIIrd to IVth ventricle. Surrounded by grey matter (cell bodies) called the periaqueductal grey matter which is involved in pain perception and stress responses. 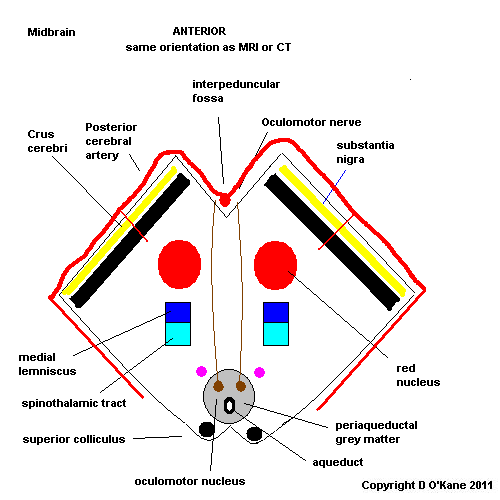 Midbrain also colourful as more anteriorly it has the red nucleus and the substantia nigra. Vascular supply is from the basilar artery and the posterior cerebral artery. 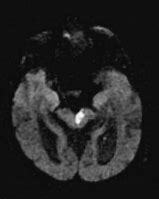 Infarction can be medial, laterally, rostral or caudal and can extend to thalamus and cortical areas supplied by PCA. The brainstem is vulnerable to both ischaemic and haemorrhagic strokes. Outcome is very variable depending if strokes are unilateral or bilateral. What is important to note is that despite the narrow brainstem the arterial supply is usually from the vertebral or basilar arteries and lesions tend to respect and not cross the midline. 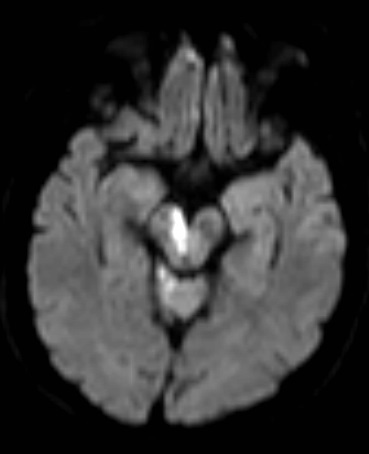 It is however possible for a very diseased basilar and especially a top of the basilar syndrome to cause multiple bilateral and asymmetrical strokes. Brainstem stroke is not a term to be used only in its most general sense. Cranial nerves and other signs should help one to localise to midbrain, pons and medulla and MRI will support this and the specificity of the location - ventral or dorsal pons etc. Upper or lower midbrain, medial or lateral medulla. In the 19th century when stroke location and clinical appearance could only be precisely diagnosed by post mortem French neuroanatomists described and named a collection of brainstem strokes and their clinical signs. These are often used in texts. However, the eponymous terms are not important if the understand how the anatomy and clinical correlate.